Avoid tree topping; always use a certified arborist to care for your trees. A tree is getting too tall, so you decide to “give it a haircut” and cut the top of the tree off… sounds harmless enough, right? It’s not! This practice is called ‘topping’ and is actually quite dangerous! Let’s take a look at why tree topping is dangerous and why you should always call a certified arborist to trim your trees properly. What is tree topping, anyway? Topping a tree is improperly removing a large branch or trunk section, including the attached smaller branches, at the top of the tree. Tree topping is also known as hat-racking, heading rounding over or tipping. Topping leaves a flat top and lateral branches behind. It is highly discouraged by professional arborists. What happens after you top a tree? The consequence of topping is that no one branch is able to assume ‘dominance’ and take over as the primary new growth point of the tree. Each branch is too small to assume a leadership role in the later growth, so many smaller branches pop up instead. These branches are less efficient in energy production and begin a chain of irregular new growth. Also, because a tree gets its energy from it’s leaves, removing so many branches at once causes the tree to enter survival mode. Since the tree thinks it is in danger of not being able to sustain itself, it forces latent buds to grow more rapidly than they otherwise would. This causes the aforementioned irregular growth patterns in the branches and puts further stress on the tree. If the tree can’t generate enough new leaves to gather energy with, the tree could die. In addition to the health hazards to the tree, topping a tree will give the tree an undesirable appearance and make it more expensive to care for in the long run. Topping a tree causes irregular and unsightly growth patterns, which require pruning. 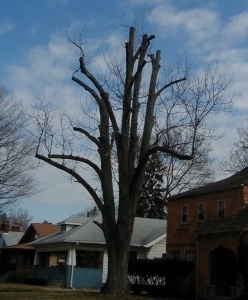 The topped tree will require repeated pruning at more frequent intervals than a non-topped tree. Always call a professional arborist. A professional arborist will never top a tree. While popular folklore often suggests the practice is harmless, a professional arborist knows better. The staff of Sharp Tree Service are professional arborists who know what is in the best interest of the health of your trees. Call us at 770-428-2543 or contact us online today to find out how we can better serve you.